← I found a script for Doctor Who. Gang violence is rife amongst these neon-jacketed thugs! 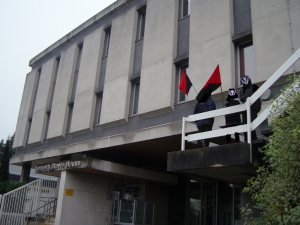 Around 20 local anarchists, friends & badgers visited the HQ of the Bristol CID & Special Investigations at Sir Kenneth Steele House on Feeder Road in Bristol last Saturday 15th November. Officers operating from there have recently been visiting people’s homes and workplaces, harassing and putting pressure on local activists, musicians and their friends to become informants for the police. As a response, it was decided to turn the tables and start asking some questions of our own. Armed with police style spotter cards displaying some of the ugly faces of Big Brother, our investigations began in the car park as decidedly nervous looking CID operatives arrived for their dirty work. Our unannounced presence seemed to produce a sort of mild panic for the first officer on the scene.